Rob Cesternino and Akiva Wienerkur cancelled their haircut appointments with Enzo so they could bring you the latest Seinfeld recap. 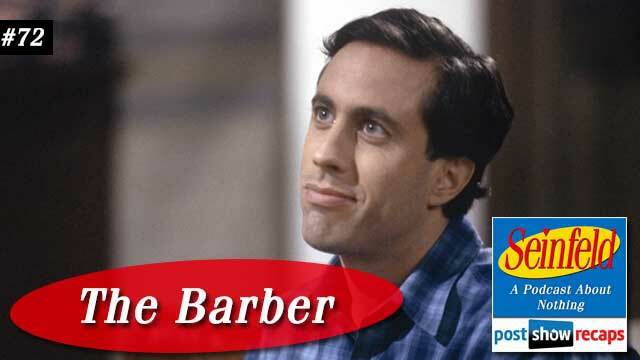 This week, they breakdown “The Barber”, which first aired November 11, 1993 as part of season five. The episode was written by Andy Robin. In Seinfeld news, Akiva shared an article from 538 that detailed how there is an increasing number of babies being born with the name Seven. Unlike what most would think, most of them are boys. This week brought an end to Akiva’s winning streak in Scene It, as he couldn’t come up with the answer from “The Finale” episode, sliding in the standings to 8-6. Before delving into the episode, Rob shared how he’s had barbers as well as dental hygienists that he’s tried to avoid over the years. Jerry’s opening standup is a bit about the chair at the barber shop being too fancy. The episode opens with George interviewing for a job at a rest stop supply company. The interview is going well, with Mr. Tuttle the interviewer even praising George for his ability to understand everything so well. When Tuttle explains George is perfect for the job, he adds “of course…”, but gets a phone call and never finishes the thought. At the diner, George is describing the interview to Jerry and Elaine, and they offer their sarcastic interpretation of what might have followed the “of course”. Kramer comes in with a new haircut, praising Gino who cut it, while teasing Jerry for sticking with Gino’s elderly Uncle Enzo for his cuts. Akiva noted that the actor playing Enzo has gone on to the alternate side. Elaine is in charge of a bachelor auction and has signed Jerry up for it, so she suggested he have Gino cut his hair, since she’s never liked his haircuts he usually gets. Kramer points out Enzo has the day off, making it the perfect time. He also wonders why Elaine didn’t ask him to be in the auction, since he could raise enough money to cure polio. Jerry heads down to the barber shop to get a cut from Gino, but Enzo happens to be there, insisting Jerry sit in his chair. After the cut, we see Jerry with a ridiculous cut, that George likened to a five year olds. When Kramer sees the haircut, he knows right away it wasn’t a Gino, promising to get him to fix it. George meanwhile has decided he will just show up for work and see how it goes, having no problem with the chance it could lead to embarrassment. George shows up at the job and accepts a small office to avoid having them check with human resources about where to put him. Rob pointed out how it was a good move for George to take the smaller office anyway, if only to avoid office politics. They give George the Pensky file, but he has no idea what to do with it, so he spends his first day doing nothing. Akiva assumed with the internet, most office workers do the same amount of work as George did. At the diner with Jerry, George recalls all he did this week at his new job, which really only entailed giving a toast at a coworker’s birthday party. Elaine comes in, and when she sees Jerry’s haircut, she burst into laughter, then quickly panics because he will look so bad for the auction. The scene cuts to Kramer getting a shave from Gino, telling him how Jerry needs him to help. When Enzo walks in, Gino quickly changes the subject to Edward Scissorhands. Rob and Akiva discuss the movie, and how it could do well in theaters today, but decided against recasting the movie. In the next scene, Jerry goes to Gino’s apartment for a secret cut. As Gino is cutting his hair, complementing him, Enzo knocks at the door, causing Jerry to hide in Gino’s bedroom. Enzo just came over to tell him how much he loved Edward Scissorhands, and notices some hair on the floor, looking very suspiciously at Gino. Akiva and Rob wondered why Gino would cut hair over a carpet and not the kitchen, and why they didn’t finish the haircut after Enzo leaves. At Jerry’s, he and Kramer are discussing how Enzo almost caught them. Elaine comes in and decides she has to take Kramer for the auction since Jerry’s hair wasn’t fixed. The scene cuts to Newman at Enzo’s getting a cut, with Enzo passively insulting Jerry and applauding Newman’s loyalty. Gino hurries out to warn Jerry, and Enzo offers Newman free haircuts to bring him a sample of Jerry’s hair. Back at George’s new office, Mr. Pensky comes in to check on George, and is remarkably impressed with George’s “work” on the file. He offers George a job, but he too leaves George on a cliffhanger with a “however”. Gino meanwhile is at Jerry’s ready to tell him about Newman when Newman comes in asking to use his bathroom. When he can’t get any hair from his comb or drain, he grabs some scissors and feigns interest in watching the movie so he can secretly cut some of Jerry’s hair. When he gets it, he scrambles out of the apartment. Newman brings the hair back to Enzo, who vows revenge on Jerry. At the charity auction, Elaine introduces Kramer, who has very little stats to impress the crowd. As he’s sashaying around the runway, he slides off and falls onto a table. Rob wondered why Kramer wouldn’t go for any money when he so easily picks up women in every other episode. Back at Jerry’s, he’s watching Edward Scissorhands with Gino, but doesn’t get as moved as Gino does. Enzo comes pounding at the door to confront them, but he and Gino are united again from a seeing a scene from the movie. George is sleeping at his desk when Mr. Tuttle comes in, purposely waking him. When he notices George has done nothing and points it out, George arrogantly says he’s Pensky material, and will go work for him. Akiva and Rob thought George could have pleaded his case much better in this situation. In the final scene, we see Enzo and Gino crying over the movie. Then Jerry sees Newman in the barber shop, and chases him around with the clippers. Instead of closing standup, the episode ends with Pensky finishing his “however” with George, using the same line Elaine joked about, with the board of directors being in trouble. Lastly we see Newman with a bald head, refusing to leave the apartment. Akiva liked this episode, but didn’t enjoy the Elaine storyline so much, so he ranked it at 148. In 2015, Rob and Akiva agreed that there would probably be no bachelor auction, Jerry might only get in trouble with Enzo for writing a bad Yelp review, and they might be watching Barbershop or perhaps the Edward Scissorhands blue ray. Johnny De Silveira emailed in to point out the music wasn’t the typical theme, but music from The Barber of Seville. He also noted the final scene with a bald Newman is usually cut out of syndication. He asked if they heard an audience member yell out “oh no” when Pensky shows up, which they did. 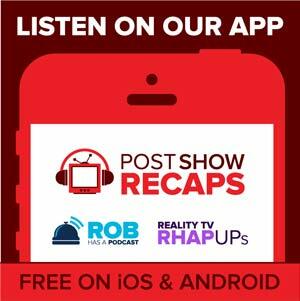 Rob noted there was very little turn around from the last episode, so they’ll get to more emails next week. Tune in next week as the guys will recap “The Masseuse”. Send in your questions by emailing[email protected]. Don’t forget to subscribe to the podcast by going to postshowrecaps.com/seinfeldITunes where you can rate and review the podcast. You can get a discussion going about the podcast by leaving a comment on the show page, and as always, you can follow them on Twitter @robcesternino and @keev26.